Manchester United manager Jose Mourinho looks to be edging ever closer to the exciting transfer of Real Madrid defender Raphael Varane. The Red Devils boss has reportedly been given a whopping £100million to spend this January, with a new centre-back his top priority, according to the Guardian. Varane was first linked with United in the summer, with the club then also thought to be willing to pay around £100m for the French World Cup winner’s signature. However, a deal could not be done at the time, though it seems Mourinho is set to try again in the middle of the season as it’s become ever clear his side need to strengthen at the back after a poor start. Varane seems ideal for MUFC’s current problems, and may be a bit easier to lure away from the Bernabeu now after Madrid’s struggles this term. The club have not looked the same since losing both their former manager Zinedine Zidane and star player Cristiano Ronaldo, so it may be that others will be persuaded to move on. 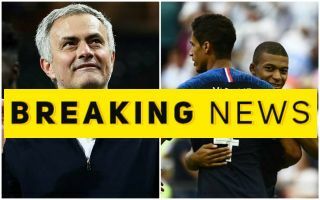 United look ready to back Mourinho in the transfer market at last after some disagreements over targets in the summer, but everyone is agreed on Varane and the money is in place for the manager to go ahead and get this move done. If United do manage to sign Varane for £100m, it would break their current club transfer record, the English transfer record, and also make the 25-year-old the most expensive defender in history.